Child of the 80s or just a retro lover? Fuzzyard has two great retro dog collars to fit out your best mate! The Fuzzyard 1983 Dog Collar is filled with bright 80s colours in a pixelated design. 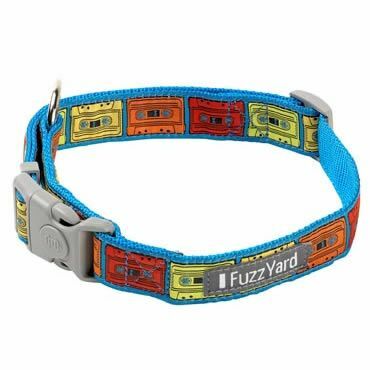 The Fuzzyard Mix Tape Dog Collar is on a blue base and features a colourful selection of cassette tapes. Match them with the FuzzYard Retro 80s Dog Leads. 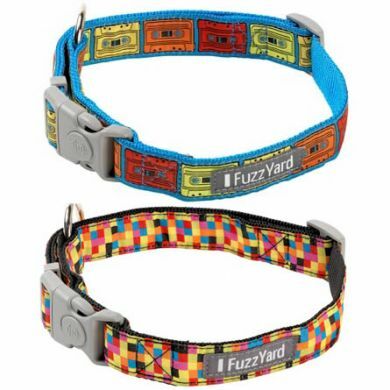 Read 3 customer reviews of FuzzYard Dog Collar Retro 80s . The average customer rating is 4.7. This is a great collar - very colourful, comfortable for my Border Collie/Beagle cross, and I really appreciate the lockable feature so that the collar can't become unfastened accidentally. My dog lost his last collar (not a FuzzYard brand!) 2 weeks ago because it became undone when he was exploring in the bush and with the collar went his council registration tag and his name tag. 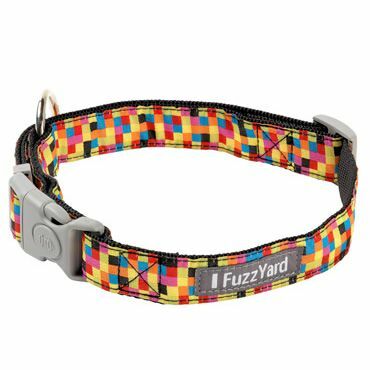 This FuzzYard collar is much more sturdy and yet it's very light in weight. Excellent value! This collar is super cute and seems like very good quality. I love this collar, it's so gorgeous. The clip is very strong and has the added benefit of a locking mechanism as well. The colours are very bright and its a very strong fabric. Highly recommended!